WASHINGTON (CNN) -- Supreme Court nominee Sonia Sotomayor has been given the American Bar Association's highest rating for "professional qualification," a political boost less than a week before her confirmation hearings begin in the Senate. Confirmation hearings for Sonia Sotomayor's Supreme Court nomination are set to begin next week. An ABA committee that reviewed her record concluded unanimously Tuesday that she is "well qualified" to sit on the high court. The nation's largest association of attorneys has been evaluating nominees to the federal bench for five decades. 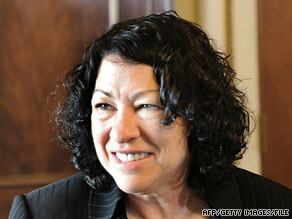 Sotomayor was last evaluated by the ABA in 1998 when she was nominated for the appeals court seat she now occupies. She was also rated "well qualified," but the vote then was not unanimous. Her confirmation hearings for the high court begin Monday, and Judiciary Chairman Sen. Patrick Leahy, D-Vermont, applauded the ABA evaluation, saying it "should eliminate the doubts of naysayers who have questioned Judge Sotomayor's disposition on the bench." The 55-year-old judge from the New York-based U.S. Court of Appeals for the Second Circuit would replace the retired Justice David Souter. The peer-review process by the ABA focuses only on a nominee's "professional qualifications and does not consider a nominee's philosophy or ideology," according to the group. It says its "impartial evaluations" focus on integrity, professional competence and judicial temperament. Past administrations have quietly worked with the ABA to provide the identity of potential nominees before they were publicly nominated. No other group has such advance access, but the ABA's role is unofficial. The George W. Bush administration refused to consider or accept the ABA evaluations, saying the organization had given lower ratings for some conservative nominees, and that the ABA had publicly held liberal positions on social and political matters. Officials in the administrations of Ronald Reagan and George H. W. Bush made the same complaint. The ABA's Standing Committee continued to rate Bush judicial nominees, but only after the president had made the choices public. Justice Clarence Thomas was rated "qualified" -- the middle of three possible ratings -- when he was being considered for the Supreme Court in 1991. "Not qualified" is the lowest rating possible. George W. Bush's nominees -- Chief Justice John Roberts and Justice Samuel Alito -- received unanimous "well qualified" ratings. Harriet Miers withdrew her 2005 high court nomination before the ABA could release its evaluation. A letter from White House Counsel Greg Craig to Leahy on Tuesday indicated the ABA had again gained its privileged access to the administration's nominee for evaluation. Republicans stepped up their attacks on Sotomayor's qualifications to sit on the Supreme Court. Minority Leader Sen. Mitch McConnell, R-Kentucky, questioned her judicial temperament in a Tuesday floor speech. "As we consider her nomination to the Supreme Court, my colleagues should ask themselves this important question: Is she allowing her personal or political agenda to cloud her judgment and favor one group of individuals over another, irrespective of what the law says?" In particular, McConnell was critical of Sotomayor's views in a highly watched workplace bias claim decided last week by the Supreme Court. The justices ruled in favor of white firefighters in New Haven, Connecticut, who alleged reverse discrimination, claiming they were denied promotion because of their race. As a federal appeals judge, Sotomayor had ruled for the city, saying officials had the discretion to withdraw promotion tests when too few minorities would have qualified for advancement. The high court majority ultimately rejected her conclusions. McConnell repeated concerns raised by some conservatives that Sotomayor might favor certain groups over others because of her personal views. "It's a troubling philosophy for any judge -- let alone one nominated to our highest court -- to convert 'empathy' into favoritism for particular groups," he said.